The original name of Tolworth was Taleorde and was mentioned in the Domesday Book. Its spelling gradually changed to Talworth and remained like that until the 1880s when it became Tolworth. By 1908 the hamlet of Tolworth was beginning to change. The population growth had started to accelerate due to the development of the brickfields and the building of Tolworth Sewage Farm, both in Red Lion Lane. It meant that the area had a proper drainage system and the District, therefore, was ready for development. The London to Southampton railway ran through Surbiton; St Matthew’s Church had been built for a congregation of 800; St Matthew’s School was on the corner of Ewell Road and Broomfield Road; the Isolation hospital in Red Lion Lane had been completed and trams started running from the Red Lion pub to Surbiton and Kingston. Tolworth was therefore linked to these towns by efficient public transport. In 1908 the area was still being used for agricultural and dairy farming by the seven farmers of this hamlet. The Pyne Road Mission Hall was used as a centre for the social life of the area and the Douglas Road Parish Hall opened for use by the many clubs and societies affiliated to the church. It also became the meeting place for the 1st Tolworth Scouts. With so much countryside on the doorstep many families would ramble over the fields to Chessington and the Bonesgate and pick blackberries in season. It was in 1908 that the Curate of St Matthew’s, the Reverend Reggie Bullock, also took young members of the Lads Club on such a journey. 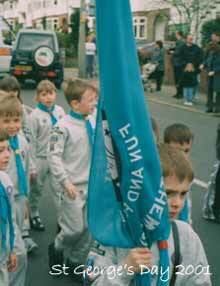 These youngsters were to become the first members of the 1st Tolworth Troop whose pioneering journey we commemorate today. By the end of 1908 St Matthew’s School was overcrowded and the Surrey County Council built Tolworth Infants School and the adjacent Boys School on a site between Douglas Road and Red Lion Lane. Over the years estates and farms were broken up into plots of land for housing, particularly in Ewell Road, Ditton Road and Ellerton Road. In 1915 our first Cub Pack was registered and in 1918 Reggie left the flourishing parish. He was followed by the Reverend J Clifford Banham who became Vicar and the Scoutmaster. 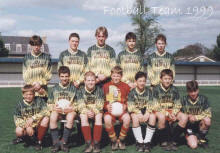 He was also talented in his work with young people. Four years after the end of World War One the British Legion opened its building in Hollyfield Road for servicemen who had fought in the War. In 1927 the Kingston By-Pass opened which attracted light industry and building contractors to Tolworth. Six and a half miles of new residential roads, containing 2000 houses, were built including Hamilton Avenue, Princes Avenue and the Sunray Estate. 57 shops, the nucleus of The Broadway, were built on the pastures of Tolworth Lodge Farm after it was sold for development. About this time trams were replaced by trolley buses. Tolworth Central School, built on the site of Fullers Farm, opened in 1932 for boys and girls and six years later Tolworth was linked by a branch railway line to Wimbledon and Waterloo. After the War the blackout thankfully ended, street parties were held but rationing continued. By 1947 the continuous development of Tolworth was halted by the Town and Country Planning Act which established the Green Belt around London. In the following years the Kingston By-Pass became increasingly important due to the use of the motor car, the development of industrial estates with new factories and the growing importance of London Airport. The 22 storey Tolworth Tower was built on the site of the Odeon cinema at the Toby Jug roundabout and completed in 1963. Fine Fare supermarket, the largest in the country, opened at ground level. Government departments used the Tower for its offices. Today, the Tower’s roof supports the wireless masts used for our local Radio Jackie whose offices are in the old Branch Post Office building in the Broadway. Charrington Bowl, with 32 lanes, also opened in the same year. An Act of Parliament set up the Greater London Council in 1965 and Tolworth changed from being a part of the Borough of Surbiton to joining with Kingston to form the current London Borough of Kingston Upon Thames. 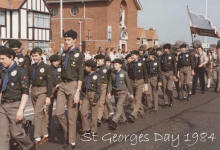 In 1966 the Mission Hall in Pyne Road was donated to the Group by the trustees of 1st Surbiton Park (Spark’s) Scout Group in whose memory our current building is named. Due to age and being declared unsafe, it was demolished and rebuilt in 1992. A fund raising initiative called “Raise the Roof” enabled much needed funds to be obtained by various methods. During the past Century Tolworth has continually strived to improve itself, to modernise, and for the residents to increase their standard of living. 1st Tolworth have survived these 100 years due to the enthusiasm and dedication of many adult leaders. We can all be proud of their contribution in helping the youth of our neighbourhood to become better adult citizens in accordance with the Scout Law and Promise. Many supporters, parents and Old Scouts over the years have given valuable service to the Group. Without doubt, one and all will wish that 1st Tolworth continues to flourish for many more years to come. We have visited the memorials and cemeteries of the 13 Scouts who died during the war. They all have their names recorded on the Panels at the back of St. Matthew’s Church, Surbiton, on the Polyapes camp site Scout Memorial at Stoke D’Abernon and on the Surbiton Civic War Memorial. R. Pike is also listed on the Hook, Surrey War Memorial. There is limited Church and Troop information available concerning the time they were members and, where known, this is recorded against their name. The Curate, the Rev. Reginald (Reggie) Bullock, MA Cambs, founded the 1st Tolworth Troop and was our first Scoutmaster. The Troop started in a very small way in 1908 and was registered with Headquarters on 05/03/1909. We are indebted to Ken Cowdery of the Royal Borough of Kingston Upon Thames War Memorials Association for the gift of certificates and information supplied including the 1911 Census, dates of birth (DOB), dates of death (DOD) and memorial or cemetery where honoured. A choir boy at St. Matthew’s Church from at least 1907-1911 and may very well have been one of the first Scouts in our Troop. Private 368108. 7th Battalion London Regiment. This was a volunteer unit. DOD 25/07/1918. Pozieres Memorial, Somme. After leaving school he joined the General Post Office and by March 1916 was an Assistant Postman at Kingston. His name is also recorded on the Memorial Board at the current Customer Services reception, Royal Mail Kingston/Surbiton Delivery Office, 79a Villiers Road, Kingston Upon Thames KT1 3AW. A boarder at 7 and 9 Thames Street, Kingston Upon Thames. Rifleman 470476. 1st/12th Battalion, London Regiment (The Rangers). DOD 01/07/1916 (the first day of the Battle of the Somme). Thiepval Memorial, Somme. A choir boy in 1909 and in 1910-11 was a St. Matthew’s Sunday School teacher for boys. Confirmed on 30/03/11 and was also a Patrol Leader. At Tolworth Council School Samuel completed 10 years and his brother James completed 7 years perfect attendance in 1910. The year before, Samuel was presented with a silver watch and chain. Emily Sweet completed 9 years perfect attendance in 1905 and was presented with a silver watch and her younger sister, Elizabeth completed 7 years perfect attendance, both at St. Matthew’s School. One of these sisters became a teacher at St. Matthew’s Sunday School in 1907-08. Corporal G/2484. 1st Battalion, East Surrey Regiment. DOD 20/07/1916. Thiepval Memorial, Somme. James was recorded by the Curate as wounded when he wrote a brief history of the Troop in November 1918. The Sweet family also had to bear a triple loss with the deaths of Frederick (1914), Samuel (1916) and Henry (1918). 168 Thornhill Road, Tolworth. The family emigrated to Australia in 1912. DOB 1st quarter of 1898. Private 247. 24th Battalion, A Company, Australian Infantry. DOD 05/08/1916. Villers-Bretonneux Australian National Memorial, Somme. On his military records it stated that George was the first to start the Boy Scouts at Cranbourne, Victoria. He also taught classes to boys in first aid and signalling. George saw war service in Egypt, Gallipoli and France and was awarded the 1914-15 Star, British War Medal and the Victory Medal. 25 Red Lion Road, Tolworth. Private 3136. 1st/1st Battalion , London Regiment. Then Private 48292 Machine Gun Corps. After this Army training was commissioned as a 2nd Lieutenant, 58th Battalion, Machine Gun Corps. DOD 22/08/1918. Querrieu British Cemetery, Somme. His mother’s epitaph on the headstone reads “Ever In Our Thoughts”. Herbert was awarded the Sultan’s Sudan Medal (clasp for operations in Darfur 1916). 2nd Lieutenant. 46th Squadron, Royal Air Force. DOD 08/10/1918. Tincourt New British Cemetery, Somme. Flew Sopwith Camels that were made in Kingston Upon Thames. In a two month period claimed six victories (five shared) meaning he was regarded as an ace. Killed in a crash at Arthies Airfield, near Arras, France. 1 Dairy Farm Cottage, Ewell Road, Tolworth. Rifleman 391862. 9th Battalion, London Regiment (Queen Victoria’s Rifles). DOD 01/07/1916 (the first day of the Battle of the Somme). Gommecourt British Cemetery No. 2, Hebuterne, Pas de Calais, France. 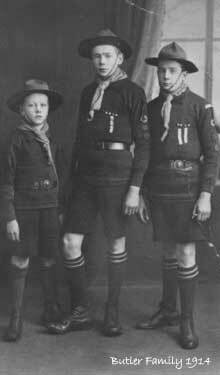 Became an Assistant Scout Master in July 1913. Both sisters were district visitors for Bond Road, Tolworth in 1907-11 at least and one of the sisters taught girls at St. Matthew’s Sunday School from 1908-10. From 1909-11 Miss H Case was an elected member to the Church Council. In August 1913 Mr Case was described by the Curate as an invaluable aid to Scouts and presented him with a Scout Thanks Badge as he and one daughter left the District for Horsham. Captain. 7th Battalion, East Surrey Regiment. DOD 30/11/1917. Cambrai Memorial, Louverval, France. Private 3696. 2nd/13th Kensington Battalion, London Regiment. DOD 27/09/1916. Maroeuil British Cemetery, Pas de Calais, France. His parent’s epitaph on the headstone reads “True Hearted, Whole Hearted, Faithful and Loyal to God, Home and Country”. 131 Ellerton Road, Tolworth. Lived with an Aunt, Blanche Winter. Private 353436. 7th Battalion, London Regiment. This was a volunteer unit. DOD 07/06/1917. This was the first day of the Battle of Messines. Voormezeele Enclosure No. 3, West-Vlaanderen, near Ypres, Belgium. A choir boy in 1909-10 and confirmed on 30/03/11. In July 1913 promoted from Second to Patrol Leader. 24 Red Lion Road, Tolworth. Signalman J/31060. HMS Jason, Royal Navy. This ship was a minesweeper that was lost by striking a mine laid by German submarine U78 on 11/02/17. 73 Officers and men from a crew of 98 were saved by the accompanying vessel, HMS Circe. DOD 03/04/1917. Chatham Naval Memorial, Kent. A choir boy in 1912-13 and in March 1913 gained the Leatherwork badge. Ships Stewards Assistant M/10824(PO). HMS Black Prince, Royal Navy. This Cruiser became separated from the Grand Fleet at the Battle of Jutland 31/05-01/06/16. In the dim light of morning some German Battleships were mistaken for the British Fleet. They opened fire with a tornado of shells which resulted in the Black Prince blowing up with a loss of all hands – 857 crew. DOD 31/05/1916. Portsmouth Naval Memorial, Southsea. Private 51611. Suffolk Regt. Then joined 16th Bn, Lancashire Fusiliers as Private 50728. DOD 05/11/1918. Buried in St. Paul’s Churchyard, Hook. His mother’s epitaph on the headstone reads “Abide With Me”. Southern Hospital, Birmingham to the Hillcrest Auxiliary Hospital, Coventry. He died here of influenza and pneumonia in the dreadful Spanish Flu pandemic at the end of the war. One of his sisters, Gladys, had died of influenza on the 1st November, aged 15 while working in Hampstead as an assistant children’s nurse. Their cousin had been killed in France six weeks previously. It must have been a very sad time for the Pike family. At two of the memorials and at all cemeteries, Margaret was able to touch each Scout’s name, call out his name and say a prayer on behalf of 1st Tolworth. At Thiepval and Villers-Bretonneux memorials she touched the appropriate panel as names were out of reach. It was all very emotional, standing at each memorial and headstone, remembering those who had given their lives for our country. THEY SHALL GROW NOT OLD by Laurence Binyon. From the poem “For the Fallen”.